The multi-disciplinary perspective provided here offers a strategic view on built environment issues and improve understanding of how built environment activities potentially induce global warming and climate change. It also highlights solutions to these challenges. Solutions to Climate change Challenges in the Built Environment helps develop an appreciation of the diverse themes of the climate change debate across the built environment continuum. A wide perspective is provided through contributions from physical, environmental, social, economic and political scientists. This strategic view on built environment issues will be useful to researchers as well as policy experts and construction practitioners wanting a holistic view. This book clarifies complex issues around climate change and follows five main themes: climate change experiences; urban landscape development; urban management issues; measurement of impact; and the future. Chapters are written by eminent specialists from both academic and professional backgrounds. The main context for chapters is the developed world but the discussion is widened to incorporate regional issues. 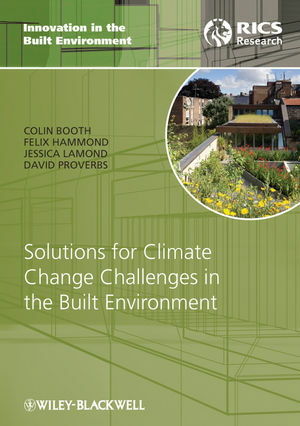 The book will be valuable to researchers and students in all the built environment disciplines, as well as to practitioners involved with the design, construction and maintenance of buildings, and government organisations developing and implementing climate change policy.